March and April are fantastic months to be in Bahrain. The weather is comfortable and the Spring of Culture is taking place. Of course, it is fun to see big names like Bocelli, but what I love about Spring of Culture is we get to see lesser known, but amazing, performers from around the world. There will be lecturers from Lebanon, Morocco, Yemen and Tunisia; dancers from Cuba and India; an international poets panel; and family events by creative teams from Scotland, Italy, Lebanon and Australia. The government sponsors much of Revealing Bahrain’s month-long, extravaganza of art, music, dance, poetry, and children’s programs. 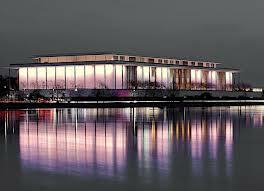 Except for the ten ticketed shows, most events are FREE to the public. A new addition to this year’s line-up is the newly opened Bahrain National Theater that reminds me of the Kennedy Center. Il Divo, the Mahler Orchestra and Yanni will be performing there. The Cuban dancers be performing at the beloved Arad Fort where every year we encounter a new parking experience. Spring of Culture is more web-savvy this year. Their updated website is a huge improvement. And you can LIKE them on FACEBOOK and keep up on Tweeter. A big congratulations to Sheikha Mai, who with strength and finesse, single-handedly deals with the opposing voices. Thanks to the Ministry of Culture team for once again highlighting all that is good about living in Bahrain. 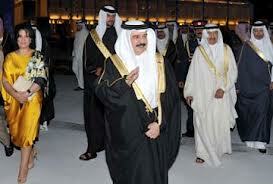 Bahrain is the island of many cultures and nations. My Irish friend invited Mojo and I to attend the final evening of the French Festival Week at the Sofitel. 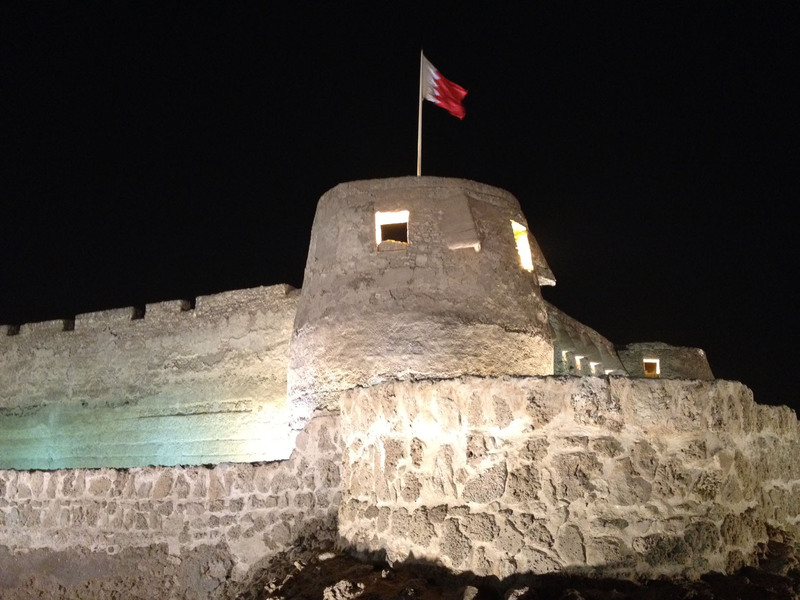 We were accompanied by a British couple who moved to Bahrain last March and love living here. At the entrance, we kissed hello to our friends from Bahrain, Belgium, France, America, the UK, Greece, Italy and Denmark. With our group sat two other couples: the House of Designer Shaik founder and his karate black-belt wife and business partner along with two young Bahraini women. One woman covered with hijab worked for a local bank. The other was dressed in a knee-length peach-colored suit and wore pearls. Her accent was American and she worked at the US embassy. 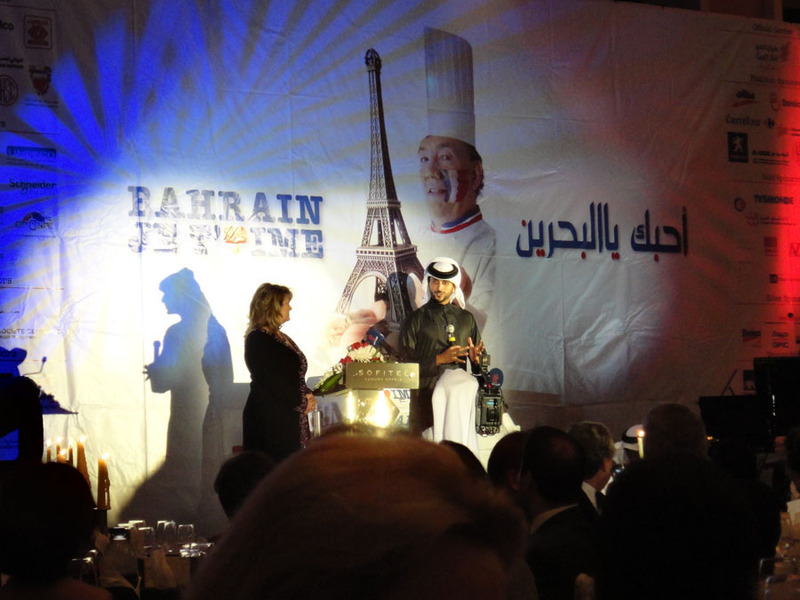 HRH Sheik Nasser stopped by with his entourage to welcome the French Ambassador and the guests. A British woman emceed the evening. Seven, young talented French opera singers entertained the champagne-sipping audience. 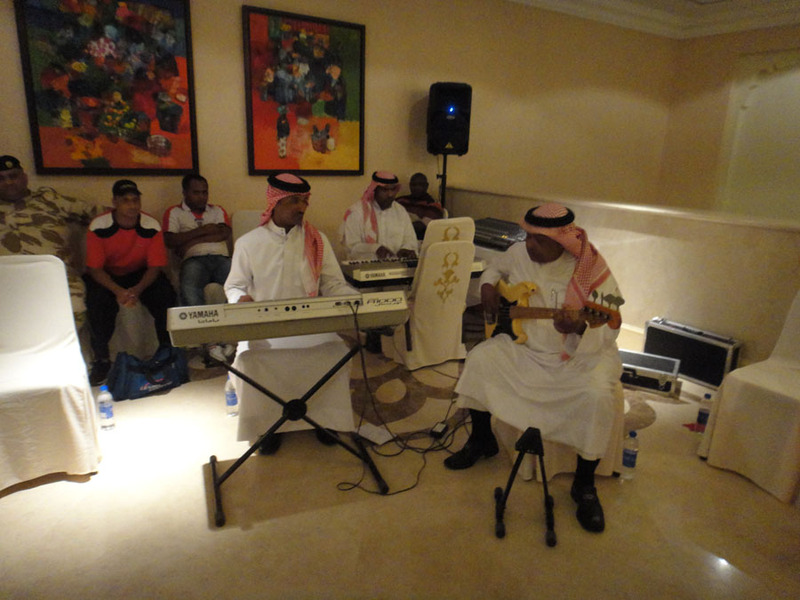 But my favorite part of the whole evening was the Bahraini trio who played Bob Marley during the cocktail reception. Italian glass artist Giuse Maggi’ s exhibition is November 25 and 26. Her pieces sell out quickly so you must get there early. A geologist by training, like other expats, she discovered her passion for glass artistry when she and her husband left Italy to live in Saudi Arabia. A decade later she has built up an impressive resume and a huge clientele in Saudi Arabia and Bahrain. She is included in the 2000 New Glass Review. 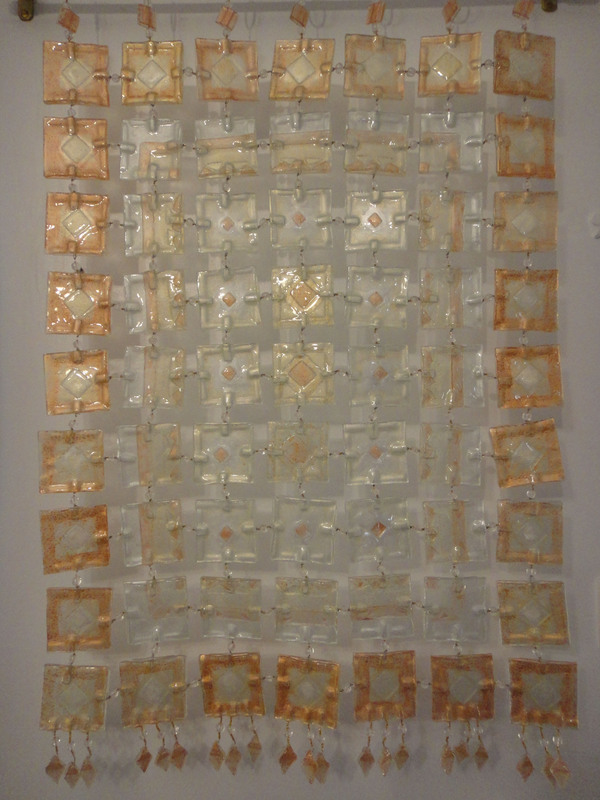 In 2009 she won a CBS Dichroic Glass Award for her multi-layered glass designs. Both the National Museums of Saudi Arabia and Bahrain have exhibited her work. Giuse teaches her craft to other budding glass artists. They have exhibited their own work thanks to her. Although I have my own flying carpet, I go to all of her exhibits. I love her art and being in her studio. The exhibit is at the Al Nakeel Compound Villa 28, next to Jawad Dome. 9am-6pm. 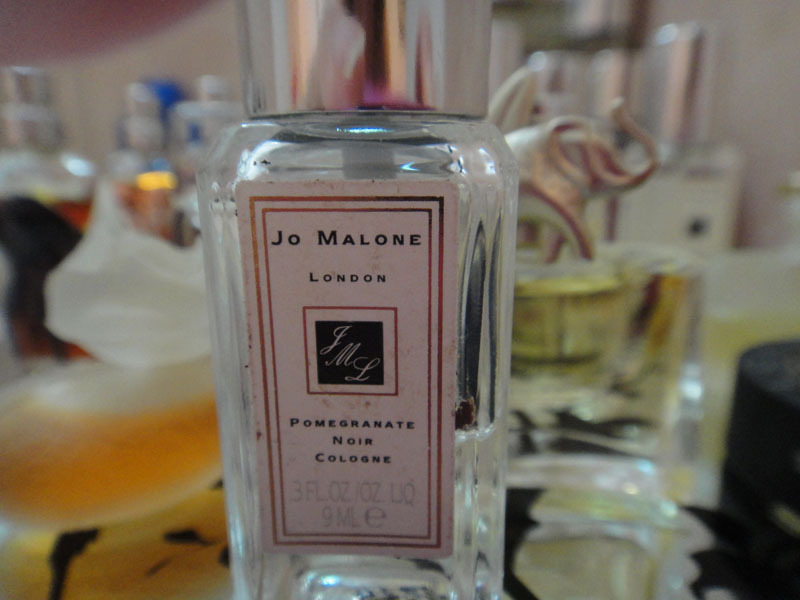 Before leaving for dinner last night, I sprayed on Jo Malone’s Pomegranate Noir cologne. Instantly I found myself transported to my friend Deborah’s guest bathroom one warm morning. Next to the sink, she had set out Pomegranate Noir hand cream and cologne for her guests. I softened my hands and sprayed my hair. When I rejoined my three friends on the veranda, my essence enveloped everyone. We laughed as we sat around her table under the fan, sipping Russian Caravan tea, telling about our most recent trips to Syria, Ireland and Oman and recounting stories of our mothers, fathers and children. Living overseas is like a pomegranate. You move to this entirely different land with its own smooth skin. At first the round red orb is like a completely different planet, one you have never seen before. Then after a bit of study and adjustment, you figure out how to peel the skin. When you open the fruit inside you discover lots of different cultures, both expat and local. Generally the people are quite interesting and before you know it, you find you have all these amazing friends from around the globe. Each is packed with tiny, sweet stories about the lives they have led. The richness of your time together stains your hands. Just as pomegranate juice is known to keep us young, the memories of your expat years stay with you forever. The Pomegranate Noir lingered on my pillow, waking me. And in the blackness of the night, I began to think about my friend Deborah who returned to Australia last summer. My rational brain knows being an expat means my friends will eventually go home or depart to new assignment in a new country. We can stay in touch. Someday I will visit her. But still – my heart misses my amazing friend and I weep as I remember sitting together in her garden surrounded by palm trees and bougainvillea. The Pomegranate Noir of expat life.